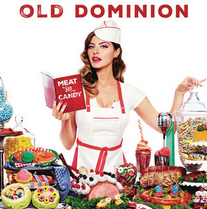 Old Dominion have released their debut album, ‘Meat and Candy’, produced by grammy-winning songwriter Shane McAnally. Their first full-length album follows the release of their self-titled EP earlier this year, which produced the smash-hit single ‘Break Up With Him’. Throughout the summer, Old Dominion played to large stadium crowds opening for Kenny Chesney on ‘The Big Revival Tour’, helping the single to reach #3 in the country singles chart. The new album continues the band’s familiar contemporary country sound. ‘Meat and Candy’ is available in the UK right now!